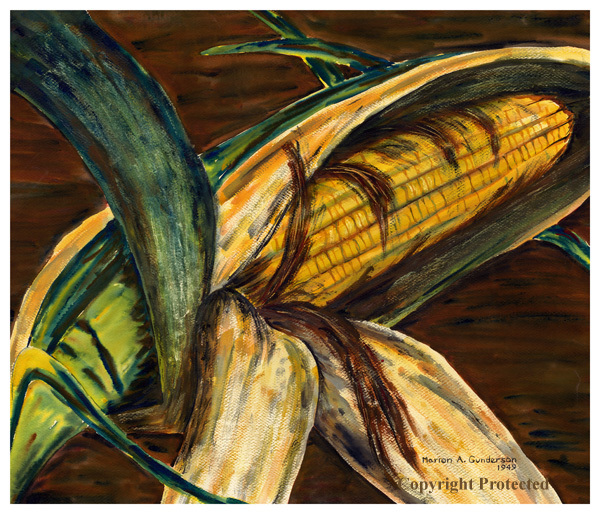 When I saw Bill and Judy Carmichael’s Ear of Iowa Corn, it seemed very similar to a painting Mother had given Sara (Olerich) and Dale Schoenefeld as a wedding present. Mother painted that painting, Iowa Corn, in 1956. Sara and Dale’s Iowa Corn was not in the small photo album Mother had created of most of her paintings, nor did I remember this painting until Sara mentioned it to me and, in 2006, sent me photographs of it. Just as with noted artists who paint more than one version or interpretation of something, the same was true with Mother. Here are two paintings of an ear of Iowa corn, painted seven years apart, yet they’re similarly composed. The 1949 painting is signed “Marion A. Gunderson.” The background is more brown than black. The husks have a lot of green in them and are spread apart, and brown corn silks are evident in the husks and on the ear of corn. Individual corn kernels are well defined. On the other hand, the 1956 painting is signed “M. Gunderson” and seems to have a darker background. There is no green on the husks and no corn silks. The husks are much closer together. In addition, the corn kernels are not defined—just a few squiggles. In an earlier post, Louise described subtle differences between Mother’s two paintings of the Pocahontas grain elevator. I suspect Mother also painted two versions of a small brass bull paperweight. Our nephew Jon Moore has Brass Bull. We believe we know the location of El Toro; however, we’ve not yet been able to obtain photos of it. It would be very interesting to know what inspired Mother to create two paintings of the same thing. Did she think the painting could be improved? Did she really like the subject and want to recreate it? Did she try different techniques? Did someone ask her to paint the second version? We’ll never know the answers. Just the same, we’re curious. * For FAQ general information about prints of Mother’s (Marion Gunderson) watercolors, click here. 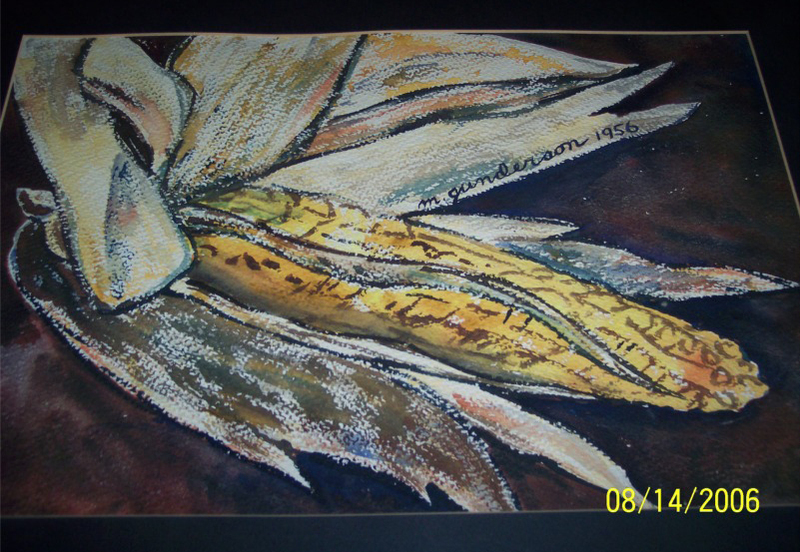 This entry was posted on July 12, 2009 at 12:05 am and is filed under Ear of Iowa Corn, Marion Gunderson, Watercolor image. You can follow any responses to this entry through the RSS 2.0 feed. You can skip to the end and leave a response. Pinging is currently not allowed. Fascinating! And well-written, Clara. THANK YOU! Btw, Jon has “El Torro,” not “Brass Bull.” At least “El Torro” is what is written in Mother’s handwriting on the back of the painting Jon has. Louise, Thank you for sending this. Clara, you’re writing is wonderful. I really enjoyed the article. Clara, So enjoyed the three articles and how connected life can be without realizing it. You know how much I enjoy your mother´s art work, but I especially liked the “The Ear of Corn”prints.